If you want to reach the broadcast booth that Steve Jones ’80 and Jack Ham ’71 have occupied together since 2000, this is the route you take. Once inside, the first thing that jumps out is the view. It’s absolutely breathtaking. Two open windows give way to a beautiful portrait of a picturesque green field sitting amid a sea of blue and white. Mount Nittany peaks over the southeast corner of the stadium, which today hosts the annual Blue-White scrimmage. It’s for this event, the first home contest for new head coach James Franklin, that roughly 72,000 fans have converged on State College on a sun-splashed Saturday that feels like early fall. The wind blows a bit, while temperatures reach into the high 60s. After a miserable winter, State College isn’t experiencing just nice weather. It’s football weather. And it couldn’t have come any sooner for the guys calling the game. Blue-White offers a different experience for everyone, including Steve and Jack. There’s still plenty of patented give-and-take between the two, but on a day when fans can park and watch the game for free, there’s a celebratory feel that permeates the atmosphere. Penn State football is back, if only for a day. Earlier in the day, director Jeff Tarman ’85, ’88g and engineer Roger Corey ensure everything is ready. Both are staples of the broadcast, the ones who make everything happen behind the scenes. Jeff’s dad, Jim, is the former Penn State athletic director who helped usher the school into the Big Ten Conference. Jeff serves as the director of broadcast operations for Penn State, and started working football games in 1991. Roger dates back nearly a decade earlier, helping with production since the early ’80s. During some downtime, a particularly funny exchange transpires when Jeff and Roger remember a time when equipment needed modifying, right on the spot. A hiccup occurred right before a broadcast as the guys were setting up. One of the plugs to a wire needed fixing, so instead of simply replacing it, the guy, a protégé of sorts, soldered the broken wire — keep in mind, this was before the digital age. Jeff remembers the guy being so nervous, his hands shook nonstop and sweat poured out. Corey recalls the moment, too, though he points out the guy made the necessary changes and fixed the equipment. “It’s a good thing, because he’d have never made a surgeon,” Corey says, laughing. Shortly after, Steve and Jack arrive. Steve’s clad in khakis and a Penn State polo shirt, while Jack, sporting blue jeans and a white dress shirt, arrives to a hero’s welcome. For the time being, the broadcast booth morphs into part clubhouse, part cigar room, with lifelong friends sharing stories and catching up. The chemistry these guys share is obvious on so many levels, and it carries over to the broadcast. Steve calls play-by-play, while Jack serves as color analyst, but nobody holds a stopwatch, waiting for his turn to talk. The two kick the conversation back and forth easily. Nothing is forced. And they provide much more insight than simply what’s happening on the field. When running back Jack Haffner picks up a few extra yards after breaking a tackle, Steve not only describes the play, but also mentions he racked up 2,000 yards while rushing for State College High School. And when wide receiver Geno Lewis fires a touchdown pass on a trick play, Steve points out that Lewis was a high school quarterback in Wilkes-Barre. Quarterback Austin Whipple enters the game, and Steve and Jack know right away that his father coaches UMass, an opponent later this season and a team that Franklin and his assistants are familiar with: Vanderbilt played UMass the last two seasons. All these tidbits aren’t mentioned after looking at the roster. Rather, the information has all been absorbed. During the game, the guys do a live interview with the Big Ten Network, which shows a replay of the game later in the day. Jacks talks about Mike Hull’s transition from outside linebacker to inside this season, something Jack did during his All-American senior season at Penn State. If the down linemen can provide a push, Jack surmises, Hull should make plenty of plays this year, especially considering he’s one of the strongest players on the team. Steve and Jack don’t just watch Penn State football. They consume the action, digest it and distribute it to the masses. During the game, they’re not peeking at notes or looking down at pre-scripted dialogue. The running conversation between Steve and Jack is fluid, organic and real. And it’s not that they’re making stuff up as they go along. It’s just that they’ve spent so much time preparing for this game, watching practices, talking to coaches and players, immersing themselves in the program, that the game becomes a canvas for everything they’ve seen and heard during the previous couple of weeks. “The two of us go to enough practices, where I think it’s our job to then relate what we’ve actually seen in the previous three weeks, as opposed to what we’re watching out here today,” Steve says, “because the previous three weeks is really where the football team’s being built, not today. Extra excitement surrounds this year’s scrimmage, with Franklin and a new coaching staff leading Penn State. Both Steve and Jack speak to the importance of Franklin’s ability to connect with players, and Hull recently said Franklin broke down a proverbial wall that the players had formed when the new coach arrived. Franklin’s ability to network goes beyond this current team, Steve notes. He’s invited back lettermen, alumni and families. The night before the game, he even visited the overnight RV lot, where fans camped out. “His outreach is great,” Steve says. In speaking to Jack before the game, he said practices are more physical and involve more hitting. He also remembers Franklin running over to meet him during that first practice he attended, even amid everything that Franklin oversees. It’s no secret that the head coach is the guy in charge, but Franklin’s tenacity has transferred over to players and assistant coaches, some of who have been highlighted in videos produced by the athletic department for their upbeat demeanor and tenacious attitude. It’s Steve and Jack’s job to convey all of this first-hand information, and they do this at the Blue-White game amid a flurry of pre-game commotion. Every few minutes leading up to kickoff, someone new pokes a head through the door, mostly friends wanting to say hello. More formal business is also required, however. A Penn State student stops in, asking if Steve has time for a pre-game radio interview, and a local high school student arrives, ready to shadow Steve as part of a class assignment. An athletics official also informs Steve and Jack that because of media requests, they’ll need a new candid shot of the two. Steve Manuel will pop in sometime during the game and take the photo. Then, with only about five minutes before the broadcast, the Big Ten Network still isn’t finished setting up in the booth. At one point, Steve walks in to find his seat moved and a BTN operator feeding cable outside the window. The whole time, Steve and Jack handle everything like pros. A few minutes later, the broadcast starts, with no hint to the extra activity within the booth just moments before. No problem. No worries. These guys have seen it all before. People continue to stop by the booth throughout the game, and all the visitors are given the same gracious demeanor. There’s a non-stop buzz in the booth and plenty of factors to consider, but Steve and Jack make all their visitors feel like their top priority. The windows are open. Other stadiums across the country feature different set-ups for radio and television broadcasts. At Indiana University, for example, the hometown radio guys have essentially a private suite, with tall, glass windows encapsulating them inside. Not so at Beaver Stadium. There’s a certain understated charm with Steve and Jack’s booth, which places them in closer proximity to cheering fans than anything else. Steve and Jack not only are all right with this setup, they love it. They don’t want to just call a game, they want to be a part of the action. Maybe it’s partly psychological, but the field doesn’t seem so far away when the windows are open at Beaver Stadium. The same goes for the fans, who sit only a few feet below. If someone were tall enough and so inclined, they could jump up and exchange a hi-five with Steve or Jack. During Blue-White, muffled conversation is audible from the bleachers, as is a baby’s periodic crying. A television studio, their booth is not. Steve and Jack say they always keep the windows open, and when they say “always,” they mean it. Even during last year’s game against Kent State, which was played during relentless rain showers, the two didn’t close the windows. Only once in their time calling games have Steve and Jack had to operate within a closed booth. That happened years ago at Iowa, before Kinnick Stadium was renovated. Steve and Jack still remember that situation, recalling it with disdain and making faces like a child who’s rejecting a plateful of vegetables. In a way, Steve and Jack are never off the clock. They absorb information seemingly every minute of every day, and it comes through in their broadcast. During the scrimmage, Steve talks of his ride into the stadium earlier that day, when nearly every vehicle he passed carried children on their way to the game. This isn’t just a footnote for the day. Steve speaks to the importance that fans have the opportunity to attend the game and park for free, which isn’t the case at other spring games. Ohio State originally charged $20 a ticket before lowering the cost to $5. To get into Nebraska’s scrimmage, fans paid $10 apiece. Florida and Wisconsin each charged $5 a ticket. The weather certainly helped, but it’s important not to overlook the outreach effort from Penn State, Steve and Jack say. Engaging the fan base and allowing families to attend without needing to buy tickets helps cultivate an ever-widening fan base. Throw in the extra bonus that spectators, especially kids, could run on the field after the game, and whatever revenue Penn State missed out on seems worth it. Penn State football has experienced a tremendous amount of change recently, arguably more turnover in the past three years than in the previous three decades. Steve and Jack have seen all of this, and they’ll continue keeping fans informed during games; at the beginning of last season, the two signed a three-year extension with Penn State. There are plenty of jabs that fly back and forth — at times, Steve and Jack seem as much like fraternity brothers as professional colleagues — and they both understand how crucial this camaraderie is to connecting fans to the action. 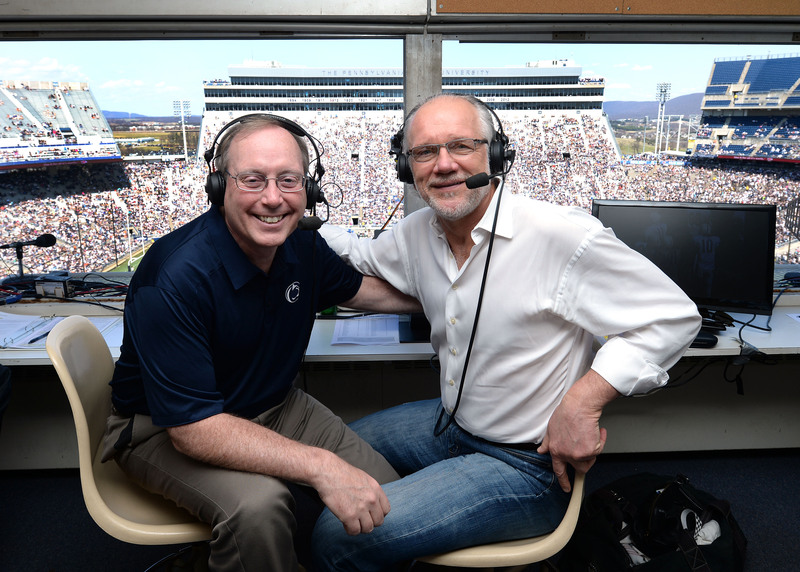 They’ve been calling games together for the last 15 years, and have been involved with Penn State for decades more. Two Penn State alums, two guys who love Penn State football. They defer to one another during interviews and broadcasts, each in effect acting like a modest youngster who’s thrilled to spend the day with his big brother. They’ve never forgotten why they’re up in the booth in the first place: to let the fans into the game, or to use Steve’s words, to “paint a picture” for the listener. It’s why they’re eager to make everyone who visits their booth feel welcome. After the game, the high school student asks Steve a few questions, one of which is what does he not like about his job. After some playful banter with the other guys, Steve takes a serious tone and says there isn’t anything he doesn’t enjoy about this job. No arrogance. No hubris. No boastful attitude. Just a couple of guys who love what they do for a living. This entry was posted in Exclusives, James Franklin and tagged Jack Ham, Steve Jones. Bookmark the permalink.